Overlooking one of the many French Riviera beaches from the Parc du Chateau in Provence, France. The waterfront along the city of Nice on the French Riviera in France, Europe has a beautiful beach that stretches along the coast for miles. 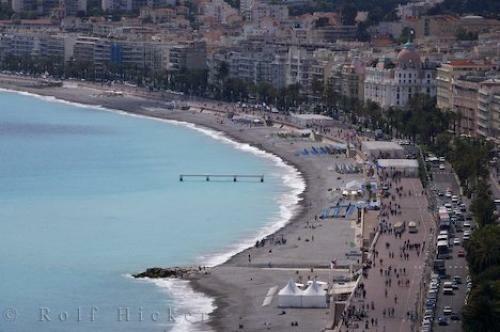 These beaches are highly populated throughout the year with many tourists that come to Nice for a vacation. The beaches in Nice are made up of small flat pebbles so tanning days may require a mat for comfort. There are approximately 15 private beaches that are marked and fenced along the waterfront with the rest of the beach open to the public. You can stroll along the entire beach close to the water's edge through the private areas as this is a throughway for all visitors. The French Riviera offers plenty of beaches along the coastline and they are recognized throughout Europe as the most beautiful places to catch some rays during your vacation to France. City of Nice waterfront, Parc du Chateau, Riviera, Provence, Cote d'Azur, France, Europe. Photo of the beach along the waterfront in the city of Nice on the French Riviera in Provence, France.